In a bold move, Jaeger-LeCoultre this year unveils an all-new watch collection, Polaris, that is inspired by the Memovox Polaris line from 1968, but that offers a contemporary appeal. 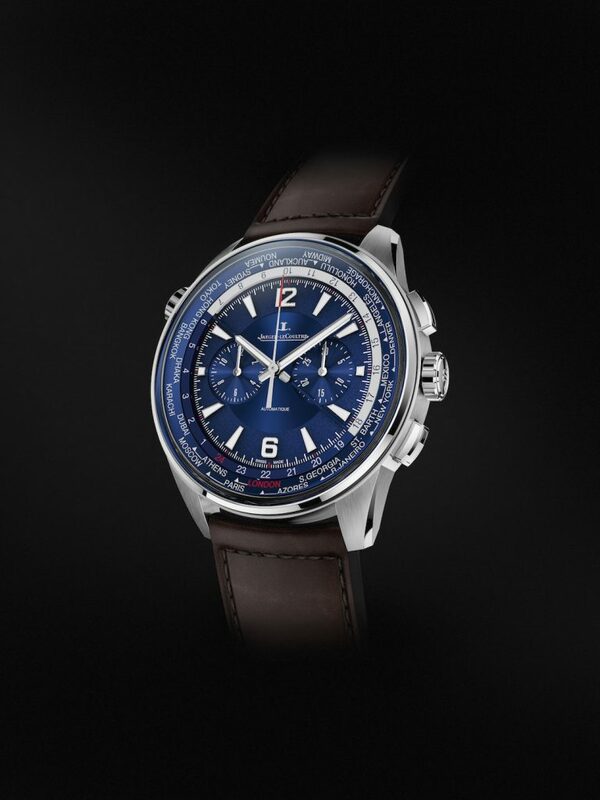 Taking distinctive design cues from that 50-year-old icon, Jaeger-LeCoultre incorporates them into a full range of watches that Include a Polaris Memovox, Polaris Chronograph, Polaris Chronograph World Time watch, a Polaris Automatic three-hand watch and a Polaris Date watch. These five key models comprise the initial release of this all-new line. There is also one limited-edition watch that pays tribute to the 50th anniversary of the Polaris Memorex watch from 1968. Each dial in the Polaris line up is distinctive thanks to three concentric circles that compose it, starting with an outer rotating bezel chapter ring in an opaline finish, and inner hour and minutes ring finished in a cicular graining pattern, and a bolder hued center circle with sun ray finish. The Arabic numerals and trapezoid indexes are applied and the hands are filled with Super-LumiNova for easier reading. While the initial Polaris Memovox was black dialed, the new range offers dials in black and in a vivid ocean blue. The case for the Jaeger-LeCoultre Polaris collection is also new and features brushed and spliced finishes for bold contrast. These watches are equipped with large crowns that recall the original model, but are redesigned for good grip. Each watch in the Polaris line offers an exhibition case back to show off the movement within. Straps for Polaris are interchangeable, and there is an all-new ergonomic metal link bracelet. Recalling the original Memorex, this limited edition version — just 1,000 pieces — features the alarm function that made the original famous. For the 50th anniversary of that watch, the new piece has the iconic three-crown design: one to set the alarm (top), one for the inner rotating bezel (middle) and one to set the time (bottom). It also offers vintage cues on the dial, including vanilla Super-LumiNova, trapezoid indices mixed with four Arabic numbers. The triangle in the dial center serves as the alarm indicator that is controlled by the alarm crown. This 42mm stainless steel watch is powered by the Jaeger-LeCoultre Calibre 956 with striking mechanism with a gong and 44 hours of power reserve. It is an important movement as it hails from the original and in all of its evolutions has been in production for 50 years. It also is equipped with a central seconds and instant-jump date-change system. 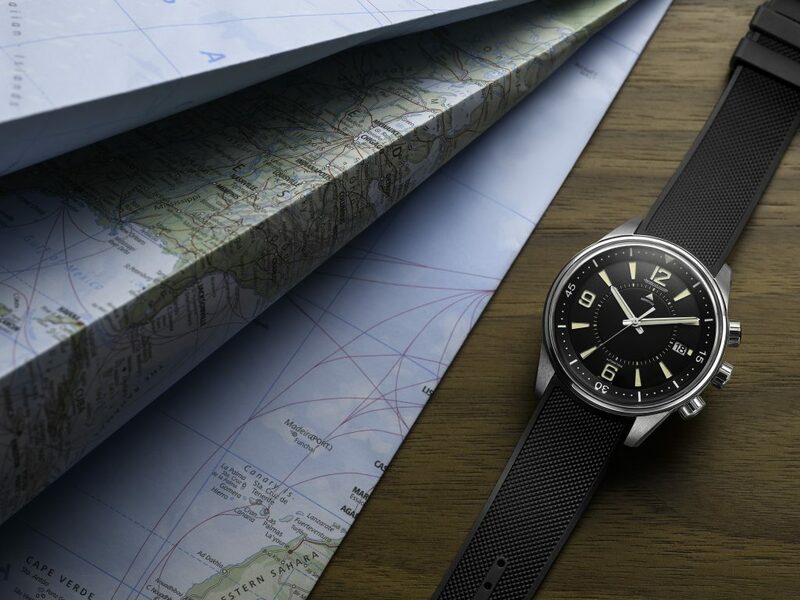 The Jaeger-LeCoultre Polaris Memorex watch is water resistant to 200 meters and is fitted with a rubber strap. Like the original Polaris, the new 42mm Polaris Date watch has a few added subtle nuances, including Vanilla Super-LumiNova triangle, trapezoid indices and Arabic numbers. A railway track for the minutes adds vintage appeal, as well. The date feature is at 3:00 on the dial, beneath a raised window on the sapphire crystal. Finally, the case back of this watch is closed and features an engraving of a Scuba diver, emulating the engraving on the inner case back of the 1968 model. The Jaeger-LeCoultre Polaris Date has the distinctive double crown system for time and inner rotating bezel. 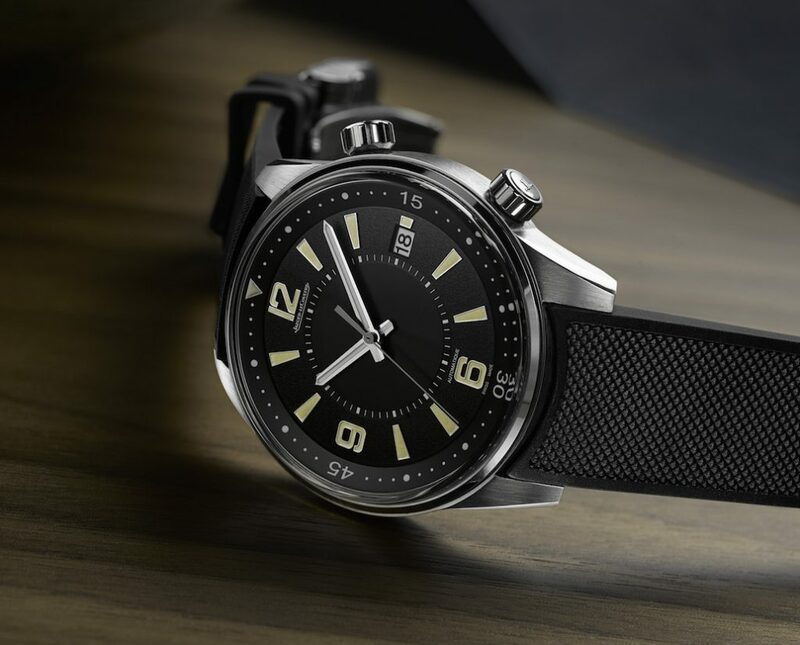 For a twist, it is finished with a new rubber strap with a Clous de Paris pattern, or with the aforementioned new three-link bracelet.This watch is water resistant to 200 meters. It is powered by the automatic mechanical movement, Jaeger-LeCoultre Caliber 899/1 and offers 38 hours of power reserve. Crafted in stainless steel with an in-house chronograph caliber, the new Polaris Chronograph, especially on bracelet, is a real tour de force in terms of looks. 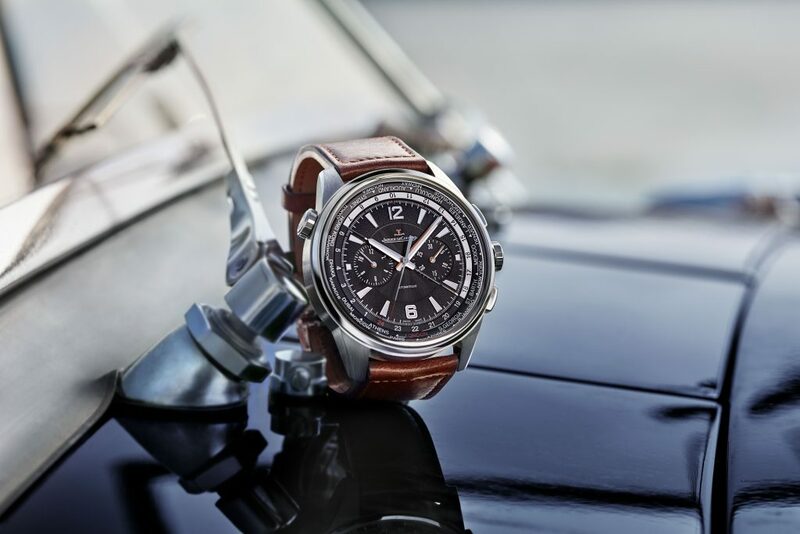 The 42mm sporty watch features a tachymeter bezel for timing speed and is reminiscent of the brand’s long-standing involvement with cars (Jaeger-LeCoultre has been known in its past to create a dashboard instrument or two). 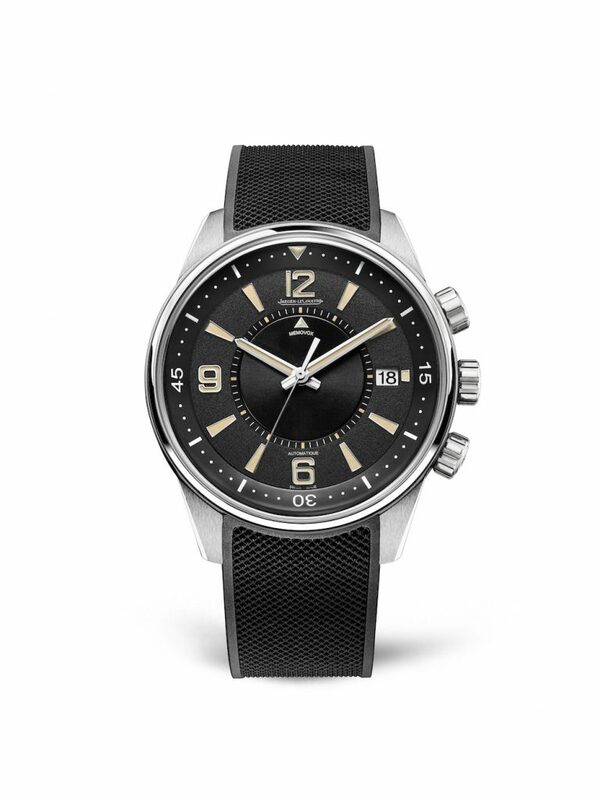 This watch is powered by the Jaeger-LeCoultre Caliber 751 automatic movement with 65 hours of power reserve. It is water resistant to 100 meters. 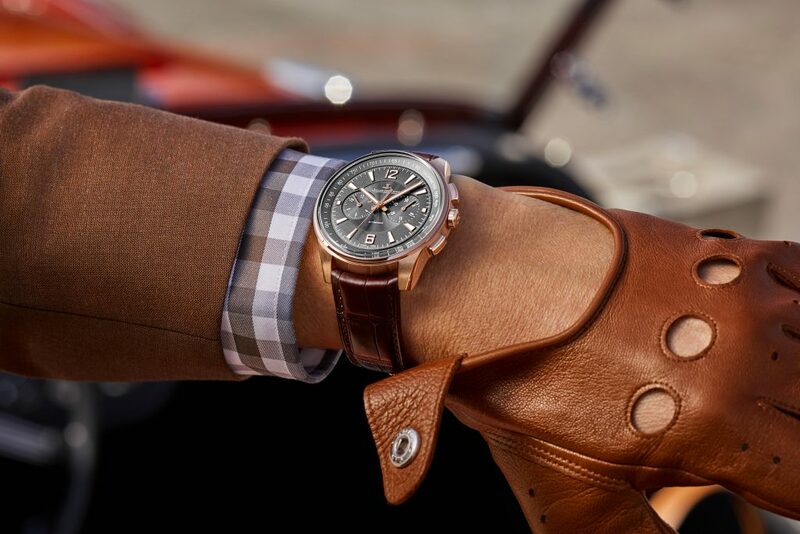 There is also a Polaris Chronograph in 18-karat rose gold featuring an anthracite colored dial and a rose gold rotor. Kicking it up a notch, the Jaeger-LeCoultre Polaris Chronograph World Time houses the Caliber 752 automatic movement with chronograph and world time complication. In addition to the two chronograph pushers, the watch sports a crown at 10:00 to operate the rotating city disk, which features 23 cities around the world. Measuring 44mm in diameter, this watch is crafted in titanium, and offered wit heather a black or ocean blue sunray dial. 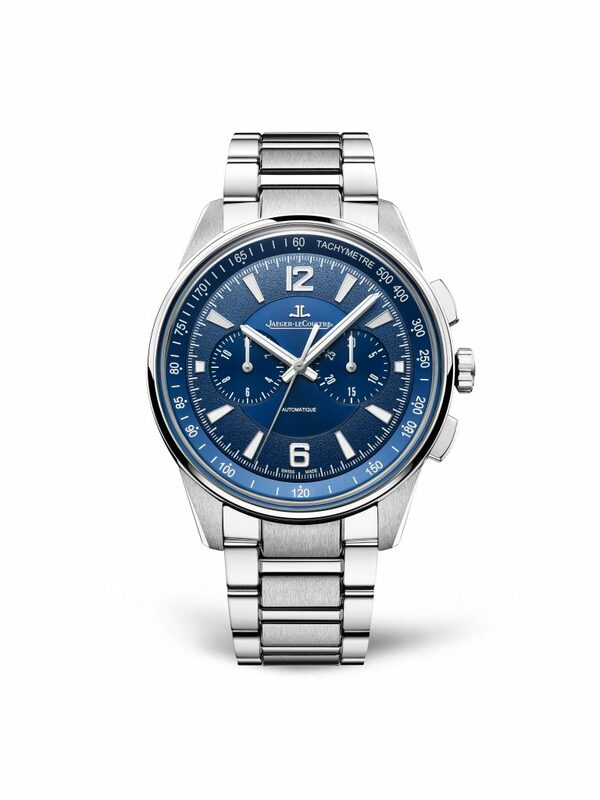 The Jaeger-LeCoultre Polaris Automatic is the opening price range for the collection. It features two crowns, one to set the time and the other to set the inner rotating bezel to track elapsed time. This dual-crown design is dedicated only to the brand’s Polars collection. Crafted in stainless steel, the 41mm watch is powered by the Jaeger-LeCoultre Caliber 898/1 with 40 hours of power reserve. It is water resistant to 100 meters. In rich ocean blue, this is easily a stand-out timepiece. 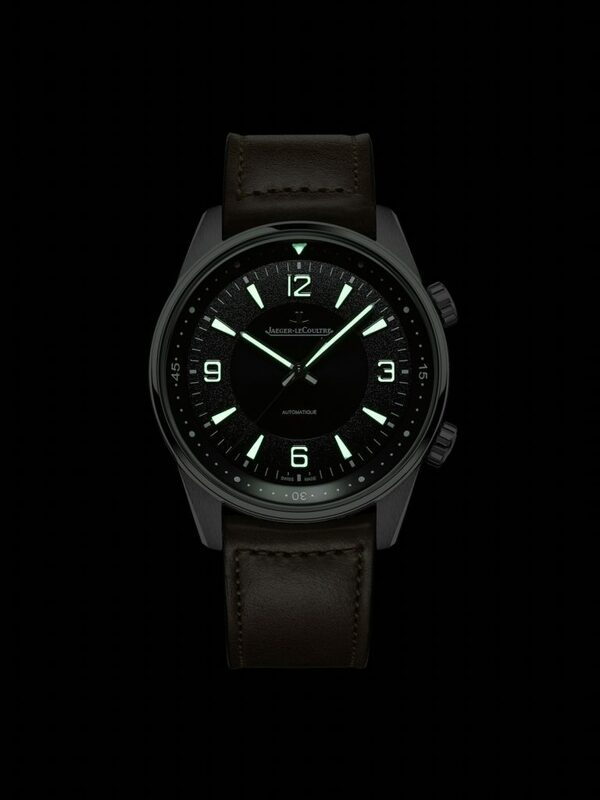 Night view of the Jaeger-LeCoultre Polaris Automatic with Super-LumiNova.